Rules for the Unruly is a distillation of surprising life wisdom from National Public Radio commentator and writer Marion Winik -- a woman who has seen it all, done it all, and would never exchange her experiences for the security of a traditional life. Winik's amusing tales of outrageous mistakes, haunting uncertainty, and the never-ending struggle to stay true to her heart strike a powerful chord with creative, impassioned, independent-minded free spirits who know they're different -- and want to stay that way. 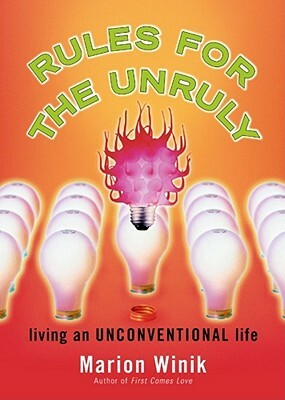 Rules for the Unruly shows us how taking risks, living creatively, and cherishing our inner weirdness can become the secret of our happiness and success, not our downfall. Marion Winik is a longtime contributor to National Public Radio's All Things Considered and the author of Telling, First Comes Love, and The Lunch-Box Chronicles. She lives in Pennsylvania with her husband and their children. Arthur Golden author of Memoirs of a Geisha Marion Winik has made a career of breaking rules, and here she's gone and done it again. Books of advice just aren't supposed to be this much fun. Ally Sheedy This is a magical, moving, funny book -- as helpful to this almost-40-year-old as it will be for any "young" adult. I love it and keep returning to it for practical guidance. Thank you, Marion! Henry Winkler Marion Winik's ability to see the human condition resonates in every one of us. She's the clearest communicator I know.